It was one of the most elaborate celebrations ever for the tiny island nation. It was also a rare long weekend to celebrate 50 years of independence. From the 7th to the 10th of August, many were dressed in red and white, the national flag colours. Singaporeans ought to celebrate this momentous event, which they did. It had been a long and hard journey. I woke up at 4am Vancouver time, in time to catch the last part of the awesome National Day Parade. My wife was sound asleep. She is Singaporean. I am not. Yet, I found myself enjoying the parade, especially with the six chapters brilliantly told with professionalism, realism, and fond memories. There were so many things I could identify with. I remembered the songs, the campaigns, the landmark events that happened in the country since independence. This week, I will share about what Singapore means to me. It's a journey through my years in Singapore. First, Singapore will always have a special place in my heart. After all, I grew up there. I studied there. I worked there for many years. I even met the love of my life there. Though I no longer live there, I still have lots of family and friends there who would readily welcome me into their fellowship. Anytime. I would get all nostalgic when I hear familiar music being played, like "Chan Mali Chan," "Planting Rice," "Di Tanjong Katong" the courtesy songs, productivity campaigns, Speak Mandarin, and even the Malay song on Children's day. I sang the national anthem, said the national pledge, and performed at school and national festivals. When Kit Chan's song, "Home" was played, I would be filled with both memories as well as confusion. Memories of yesterday and confusion of where actually is my true home. I did everything a local Singapore would have done except that I held a different passport. Even when I am in Malaysia, my "homeland," I still get confused at where home is. It was in Singapore that I encountered the gospel which gives me a totally new definition of where eternal home is: In the arms of Jesus. For the moment, home is where love is. I love Singapore not because of status but because of the beautiful people there, that I have come to cherish as friends and family. Since 2010, immigration policies have become much tighter. Although the country is increasingly unwelcoming to non-citizens like me, my admiration for the progress of the nation remains intact. Despite my whole family being Singaporean, I had to bear with the inconvenience of getting permits whenever I wanted to stay. Once I was detained at the checkpoint for trying to enter the country after being there for more than 60 days. I was told I had to remain outside of Singapore for a full 30 days before I can be allowed back in. (It was a standing policy affecting Malaysians that they can only remain in Singapore for only 60 days out of every 90-days-cycle.) That was really inconvenient. Imagine a foreign father trying to support his Singaporean son in his military service, and facing difficulty in getting a long stay permit. I was eventually allowed in, but only after overcoming a few other hurdles. Some people even asked me not to bother sending my son back. Not me. Despite what happened to me, I believe that citizenship carries a responsibility. I am happy my son has a positive attitude toward it. Citizenship is a privilege, and this privilege is often better appreciated by foreigners. The difficulty I encountered was also faced by my parents many years ago. Despite that, my late father continued to admire Singapore, in particular, Mr Lee Kuan Yew, all his life. It was over time that I began to understand why. I remembered the 70s soccer-mania when the Malaysia Cup soccer tournament was hot. My father would take me to soccer matches at the National Stadium in Kallang. Whether it was Kelantan, Penang, Negri Sembilan, or Johor that was playing the host country, my dad would usually support Singapore. The strange thing is, he was not even Singaporean. That did not mean he was not patriotic. It simply meant he appreciated how a tiny country like Singapore could bravely compete against all other bigger Malaysian teams. It was like supporting the underdog in any David vs Goliath epic. Incidentally, in terms of land size, every single Malaysian state alone is already bigger than Singapore. Like my dad, despite what happened to me at the immigration level, I still admire the country. Other than that, as I think of SG50, there is a second thought: Gratefulness. My father was a grateful man. Grateful for the opportunity to make a living in the small country. Grateful for the opportunity to give his children a good education. Grateful for the opportunity to interact in a unique culture of Singapore-style meritocracy. The system had problems, but compared to the racially-biased policies in Malaysia, ethnic Chinese often found more opportunities in Singapore than their own motherland. Sad but true. For those of you who are unaware, the constitution of Malaysia has enshrined the supremacy of the Malay race under the "Ketuanan Melayu" political concept. That means Malays will get first priority at economic policies, benefits, and guaranteed political dominance in Malaysia. There are strengths and weaknesses, of course, but because of sedition laws, no one can question that. Whatever the justification for the Malaysian policy, the common man in the street, especially the non-Malays often have to fend for themselves. Even today, thousands of Malaysians cross the causeway daily to work in Singapore. Why? Better wages. Better job opportunities. Better and more equal treatment of races. (At least at that time, even if any of my readers would dispute the present day). Many of my friends at that time found their way south to Singapore as well. Some have since taken up Singapore citizenship. Not me. Being a Malaysian is not defined by the country's politics or their leaders. Being a Malaysian is an identity given to me at birth. It is about believing that citizenship is a gift from God. Moreover, citizenship matters are very personal choices too. Having lived in both Malaysia and Singapore, I think it is important to recognize that God loves both Malaysia and Singapore, and that the two countries have much to learn from each other. That is why I feel that comparisons between the two countries need to be done sensitively. I am sometimes guilty of inappropriate comparisons. Each country has her own challenges. In some ways, Singapore is better. In other ways, Malaysia does it better. Each country has to deal with their problems in their own way. That does not mean they cannot learn from each other. They can learn about what to do and what not to do. In this manner, Singapore and Malaysia still need each other. A mature attitude would be to remember that praising one does not necessarily mean degrading the other. We need to beware of childish comparisons. If I praise country A, that does not mean I detest country B. It simply means that we give credit where credit is due, and if necessary, learn from them. Humility provides the fertile soil for the seeds of progress to germinate. For Singapore, the past 50 years of success does not guarantee the same for the next 50 years. The same goes for Malaysia. That is why there is no room for boasting. It is better to give thanks. Even in churches, childish behaviours can occur. There was one Church that happens to have two strong leaders. When Leader A proclaims: "My group will adopt a study that is biblically based." Leader B was quick to interject: "You mean MY group is NOT biblically based?" Why must people like Leader B jump the gun to paint everything so black and white? Just because Leader A emphasizes a desire for his group to be biblically based does not necessarily mean Leader B's leadership is not biblical. This is what I call an Either/Or thinking. It's like an insecure wife who gets upset when her husband praises another woman's beauty by saying: "You mean I'm not beautiful enough for you?" It also smells of human pride. A pride that swims in the waters of self arrogance. Why can't Leader B be challenged to support Leader A's initiative, and if needed, use it as an opportunity for self-examination of his own group? Likewise, just because one speaks well of Singapore does not necessarily mean one is speaking badly of Malaysia. The two countries have different issues to tackle; different contexts to work with; and different cultural challenges to begin with. The better way is to learn from each other. With this attitude, everyone gains. Critics vote according to sound policies, not partisan politics. Singapore-Malaysia relations can be rather tricky. The rivalry sometimes called "friendly rivalry" in a diplomatic way stems from a rocky history between the two countries. After all, Singapore was part of Malaysia from 1963-1965. Along with admiration and gratitude, there is a third thought I have regarding SG50. It is hope. 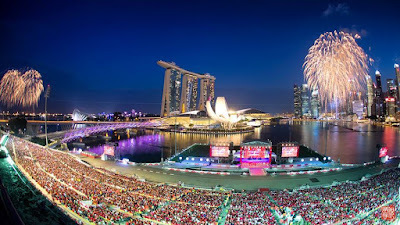 Fifty years have passed and gone, Singapore have many reasons to celebrate the progress and successes. The population is now over 5.5 million and climbing. Honestly, I don't think I can live long enough for another 50 years. The future belongs to the younger generation. How they are able to chart the direction of the nation depends a lot on the qualities of her leaders. Singapore needs leaders of conviction rather than seekers of convenience. That is one reason why ministerial pay remains such a hot potato topic. The high salaries will give the perception that money talks louder than conviction. Only with conviction, can one not be distracted by immediate results but to maintain the hope for the long haul. Running a country is never a short term project. Leadership is not about making popular decisions. It is about making the right decision regardless of popularity. It means discerning the best step to take and continuously persuading people to support it. Singapore needs leaders from all walks of life. The best cannot be defined in terms of material wealth, social status, or educational qualifications. Instead, they need people who are able to connect with people, both majority and minority. As Singapore becomes more cosmopolitan, they need to have leaders who are able to talk to both local and foreign talent. Patriotism is not about forcing people to do the same things, sing the same songs, or eat the same plate of food. It is about learning to do things together in the same direction. Like Eugene Peterson's famous title of a book, we can adopt "A long obedience in the same direction." This is where differences and diversities can come together for the same goal. Singapore needs to learn how to adapt to new challenges. As much as we enjoy SG50 and the fifty wonderful years of rapid progress and achievements, the country cannot rest on her laurels. The Chinese has a saying, "学好三年,学坏三天" which can be a warning to anyone becoming conceited about the past. In the same light, whatever that have been achieved for the past 50 years can be quickly destroyed. Take Israel for example. The powerful Kingdom of Israel united under King David was quickly divided into two after King Solomon's time. Subsequently, both Israel and Judah became exiled by the Assyrians, the Babylonians, and the Persians. History is no guarantee of future success. Finally, Singapore needs hope. There is no assurance that the next 50 years will be better than the previous. With the old guard no longer around, the younger leaders have to fight the battles of today and tomorrow, not yesterday's. It is easy to be so sucked into the nostalgia of yesterday that one tries to force-fit the good-old-days strategy into the new era. Hope means learning to adapt and to adjust to new realities with confidence that there is a better tomorrow. My prayer for Singapore as she celebrates SG50 would be the renewal of hope. The next generation of leaders must carry this conviction of hope. The Church can play a part in nation building. It is to pray. It is to participate in service. It is to provide spiritual guidance anchored upon hope in Jesus Christ. It is also to remind one another that nation building is a subset of something much bigger: Kingdom building. The earth is the Lord's. Let us never forget that. Whatever happens to any nation, it is the Lord who decides, not us.